This very comfortable and modernly designed one-bedroom apartment is located in the very centre of Krakow, in a walking distance from the Main Market Square. It is situated on the third floor of a recently renovated historic building (with a lift/elevator). 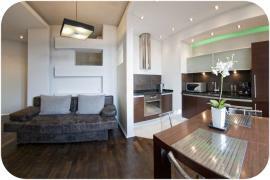 There is a double convertible sofa in the lounge (connected with a kitchenette), which makes the apartment ideal for up to 4 people. Wi-Fi internet and Satellite TV provided.